I have been navigating around for some time, trying to find the answer to my problem. 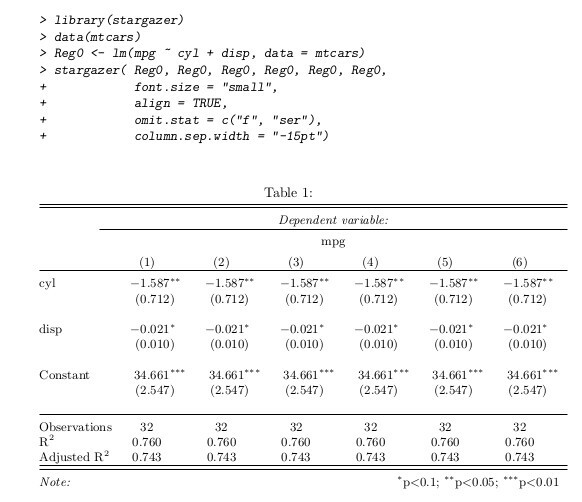 I have made a few regression in R and want to export them with the stargazer package into LaTeX. However, because of the number of regression (6), the column do go over to oblivion. I have tried to reduce the intercolumn space, but with no success. And I will attach the csv file. Not the answer you're looking for? Browse other questions tagged r column-width or ask your own question. Sweave: How to remove horizontal space in Soutput environments? apa6[jou]: How to use \columnwidth in threeparttable? How can I equalize the width columns 2-8?